Boise, Idaho. It looks like this year’s Idaho legislature might outdo the previous in attacking water quality protections in the state. 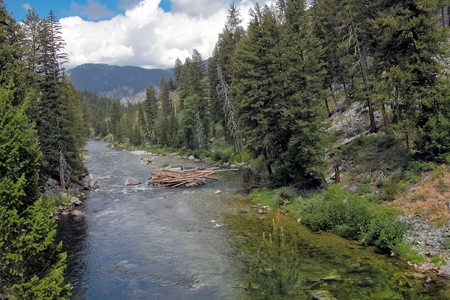 In the Idaho House of Representatives, a bill has passed the Resources and Conservation Committee that would unprotect the federal wild and scenic rivers in the state from suction dredge mining for gold. The dredge miners are primarily recreational in nature. These rivers, such as the Selway River and the Middle Fork of the Salmon River, are recognized as the highest quality in the state and of national importance. They support a large floating, fishing, guiding, hiking, biking, backpacking, camping (both primitive and often auto/truck too) economy. The Idaho Attorney General has told the Legislature that passing the bill would violate the federal Wild and Scenic Rivers Act, the Federal clean water act, and the Endangered Species act. The bill also violates existing Idaho state law protecting these streams. Some committee members said the bill was a way of standing up for states’ rights. In other action in dirty water, the Senate Agricultural Affairs Committee has passed senate bill 1376 which guarantees that Idaho dairies will never lose their operating permits to discharge waters into Idaho creeks and streams even if they dump illegal amounts of waste. The dairy industry in Idaho does about $2.4 billion of business annually, and last year they were behind passage of the Idaho ag-gag law, which is now in federal court as illegal and unconstitutional. Idaho politics really makes Ripley’s Believe It Or Not seem quite pale. Moving lands to control of the state keeps me awake at night. (I mean it!) Too bad there isn’t a Sand County Almanac test before one can be eligible to go play in politics, it is so basic to our own survival. I’m shaking my head wondering, “what are they thinking”? You guys have your hands full in Idaho just trying to stave off one conservation/environmental disastrous decision after another. To pass a bill that violates provisions in the federal CWA, and Idaho state water law is insane. Why? It goes against everything that works for ID. Tourism, more natural beauty and wilderness areas than most other states. “Standing up for state’s rights”? They need a dictionary to define ‘rights’. Idaho reminds me of a screaming, stomping toddler throwing a fit and thrashing on the floor. They’ll continue thrashing, screaming, and turning blue in the face until they come up gasping for air. Just walk away and let them thrash. Eventually, they pull themselves together when no one caters to them. Did these politicians eat too much lead based paint as a kid? Oy, what to do with Idaho? My sister use to walk off and leave my nephew when he would be thrashing and turning blue in the face from his tantrum. Maybe we should border up Idaho and let them be their own country. Just walk away. Of course, that won’t work, but that’s pretty much the way I feel. Let them stand on their own and the rest of us walk away until they get it together. Maybe we should border up Idaho and let them be their own country. Please don’t leave me here in Idaho with all the political wack-jobs. “Only 20 states depend more on money from the government than Idaho. Although federal money makes up more than 35 percent of Idaho’s total revenue, Idahoans aren’t forking over the most in taxes. I used to vacation in Idaho, but since they killed most of the wolves, and now polluting the rivers, I think I’ll just go on over to Oregon. I won’t even buy food or fuel passing through. I hear the Owahee river gorge is beautiful. Can’t wait to float it this summer. Being anti-environment for the sake of being anti-environment, regardless of the issue is the underlying theme to this story and many others. To some folks, it’s honorable and commendable to take pride in your own ignorance. I don’t want to defend the Idaho Legislature. I should point out though that very similar, and even stranger things are being considered in Wyoming. Utah, Montana, Nevada, and Arizona are behaving in a similar fashion. Nevada is usually much better, but the far right took over there in this election. I think politicians tend to forget how rivers work. They flow, often into other states, into drinking water, and into the ocean where the fish we like to eat grow. Those are resources the country as a whole depends on. If Idaho only wanted to crap where it alone eats, fine, they can be the victims of their own ignorance, instead they want to crap all over everyone. They fail to understand the ramifications of their actions, which is incredibly dangerous to everyone, not just wildlife.